Interview | Books Written In English Language May Soon Lose Readership – Manarakis. 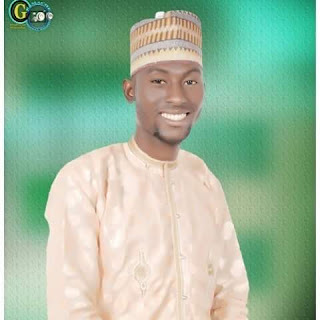 Adamu Idris Manarakis is a budding indigenous Nupe writer. Fondly called the “Philosopher of Nupe Mathematics”, he is the founder of Eduko Nupe Language Foundation, Minna. In this interview with Abubakar Akote for The Arts-Muse Fair, Manarakis believes that books in indigenous languages are easier to comprehend by readers than those written in foreign languages like English. He also challenged ANA to pay more attention to works in indigenous languages as a way to promote our arts and cultures. TAMF: When and how did you start writing? MANARAKIS: I started writing in 2008 although my major area of interest is Mathematics because I am a Building Technology Professional. When I finished from Secondary School, I developed interest in writing Mathematics textbooks, which today have been written but still unpublished. Before I ventured into writing, I had read a book, written by Paul Diner on how to be a successful Writer. I picked up my writing career after reading that book. I could remember vividly, a chapter in the book that says to be a successful writer you have two options: "either for profit or fame". I go for the two – fame and then profit. In that book, an Idea came to me to go back to children’s work that would earn me little income. So, I started writing children’s book. TAMF: Why writing in indigenous language? 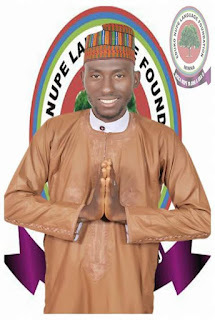 MANARAKIS: The idea to write in my native language, Nupe, came in 2010. I started writing in conventional English Language but whenever I write anything in a language that wasn’t mine, people mocked me though I didn’t feel deterred. I kept writing and from people’s criticisms, I was learning some things. An incidence I have found difficult to forget was the first day I went to ANA Secretariat for their meetings and the Chairman of ANA ordered me to go out. I though ANA was an Association that accommodated everyone. Thanks to BM Dzukogi who saw me while leaving as he was coming in and asked me to go back. He said, "This house is for all of us." Following that incidence, my interest in writing started eroding. In 2011, I had almost lost courage in writing because I felt the environment was not friendly enough for budding writers to flourish. At the 2011 edition of the Annual Schools Carnival of Arts and Festival of Songs (ASCAFS) organized by ANA Niger, I saw a participant present a poem in Yoruba language. I was very attentive though I didn’t understand the language in which the poem was being presented. When I got home that fateful day, my conscience kept pricking me. I thought of it for a while and said if somebody could write in Yoruba language, his native language for a global audience, why can’t I do the same? I sat down, created my first poem in Nupe, and posted it online on facebook. To God be the glory, I received wonderful comments from readers. It was a kind of motivation to move on. TAMF: How many book titles have you authored so far? MANARAKIS: I am the author of Workbooks for nursery pupils per term (6) with about 20,000 copies published. I have published works like Mathematics (workbook), Technology workbook (for Junior Secondary School 1-3), 3000 copies published so far, Marriage Does Not Stop Schooling, Kayan Mata, Manarakis Junior, and Yekondunu: My Model (unpublished). The books I have authored in my native language are: Ndagi Be Nnagi, Soko Deke (50), and SHANBA NUPE. My unpublished works written in Nupe are Egizhi Nya Soko, Eye lashi Soko a, Nupe Dictionary, Nupe Mathematics, Nupe poems, Nupe short stories, Nupe Quotations, Nupe Grammar and Nupe Science. TAMF: What is your level of knowledge of syntax and other basic grammatical rules of Nupe language in which you are writing and how did you learn them? MANARAKIS: As a writer, choosing the way to convince your readers or audience should always be the first thing to think of. In native languages, you don’t necessarily need to over focus on the rules of syntax. Your familiarity to the common words matters because readers don’t need to keep a dictionary beside them while reading a book. So, as far as I believe, just make your writing simple. That’s all. TAMF: But do you know each language has a kind of syntactic rules that if not properly obeyed will distort the message a writer wants to convey?. Do you have an idea of those rules peculiar to the Nupe language? MANARAKIS: Yes, of course. Why not? We have what we call Language "Orthography" which languages generally have. In Nupe Language, for instance, there are certain words or Alphabets or Consonants or Vowels you must be familiar with before you put or join words together. For example, "Nya, Nyi, Nyo, Dzu, Dzo, Bwa, lwa, Tsa, Gba, etc. TAMF: who are your target readers and what is the level of acceptance of your writings? MANARAKIS: The idea to start the Nupe Language School began on facebook. I made a Nupe post that received over 400 responses. I later announced the commencement of an online Nupe Language Class. Few supported the idea while some people called us names. We felt that the more they laughed at us, the better we become. I called that people should register through my account and a few people did. Thereafter, many people advised me to move the whole idea to a physical classroom. The Classroom lessons in Nupe language began on 19 November, 2016 with 95 students in attendance. Three weeks later, Professor Samuel Tswanya, the current Deputy Vice-Chancellor of IBB University, Lapai paid us a visit at our Nupe language learning Centre. That was on 3rd December, 2016. He was the first Professor and a son of the soil to have paid us a visit to see how well we were doing. He encouraged us and gave us some cash to buy learning materials which we did. We also received brilliant cash supports from Ambassador Solomon Adama Yisa. He is marvelously encouraging. Also from Ndagi Abdullahi, Isyaku Bala Ibrahim (Nupe writer), and Dauda Ibrahim. 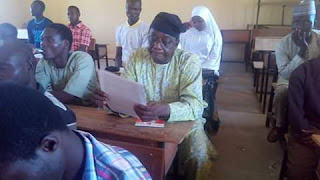 Currently, Mallam Usman Chiji has connected our class and with Crystal FM 91.3 radio, making more audience for us and it’s being aired free of charge. On 1st April, 2017, the Nupe Language School was inaugurated with 55 registered members. Currently we have a total of 65 students. Therefore, for now, my readers are those who will read in Nupe. However, with time, we hope to start translating my works to other languages for a global readership. 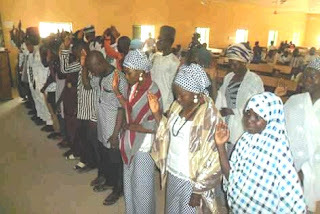 Students of the Nupe Language class taking their matriculation oath. Our Nupe Class is not only the number one teaching Centre, it is the number one Institute where Nupencizhi (Nupe people) have gathered to receive Nupe Language lectures. It is first of its kind as far as indigenous language teaching is concerned. TAMF: What challenges are you facing now? MANARAKIS: Lack of adequate moral and financial support. We have Nupe people who have the opportunities to help move this idea to a greater height but unfortunately, they have refused to key in. We have written to individuals in governments but the responses we got were not encouraging. 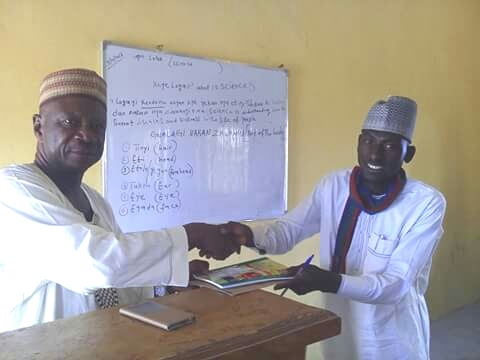 We are making efforts to get Nupe Language included as a Course of Study in the Niger College of Education. 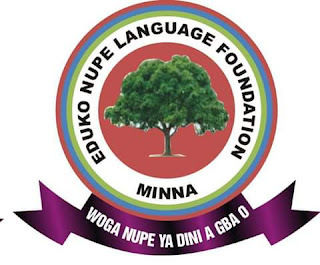 They have shown interest in our request and we look forward to realizing this dream – Nupe Language being studied in the College of Education, Minna. TAMF: Is ANA helping indigenous writers to grow? MANARAKIS: No! ANA has little or no concern for Indigenous writers. I joined ANA in 2010, and since then, I am yet to witness to any Nigerian Writings’ Anthology in Indigenous Languages. No enough space for indigenous writers to display their talents. Many indigenous authors have written commendable books that would have won the NLNG prize if they were written in English Language. ANA does not have prizes for indigenous writers. That is bad. AMF: What is the fate of indigenous writing in Nigeria and Africa? MANARAKIS: The future is bright. That is what I believe because writings in indigenous languages have direct connections with people and their cultures than the ones written in English language as far as Nigeria and Africa is concerned. In Hausa land especially, women and young girls read more of Hausa Novels than they do English ones. Even in Minna here. So, very soon, Nupe novels will equally get similar readership. When you read in your language, it is easy to understand than in a language that you would have to check the meaning of words in a dictionary, yet you may not understand it because the dictionary meaning may still be difficult for you to understand.